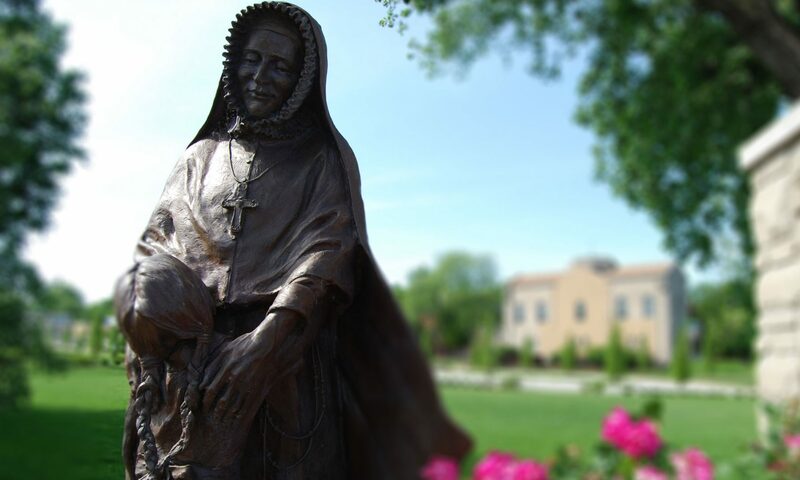 St. Rose Philippine Duchesne has been added to the St. Louis Walk of Fame! Nearly 200 RSCJ, Sacred Heart alumni, families and friends watched as her bronze star and plaque were unveiled on the Feast of the Sacred Heart, June 23, 2017. Mr. Joe Edwards, founder of the Walk of Fame, welcomed the crowd and read the inscription on the plaque. Sister Sheila Hammond, Provincial of the US and Canada Society of the Sacred Heart, and Sister Maureen Glavin, our Head of School, offered remarks. Bill Herbert’s Ragtime trio contributed to the joyous atmosphere and, at the unveiling, played “When the Saints Go Marching In.” The star and plaque are located at 6241 Delmar on the Loop (in front of United Provisions Grocery). Thanks to all who welcomed our remarkable saint’s story to the public square! The St. Louis Walk of Fame is a nonprofit organization founded in 1988. Its purpose is to showcase the cultural heritage of St. Louis and to advance the knowledge, awareness and appreciation of great St. Louisans and their accomplishments. 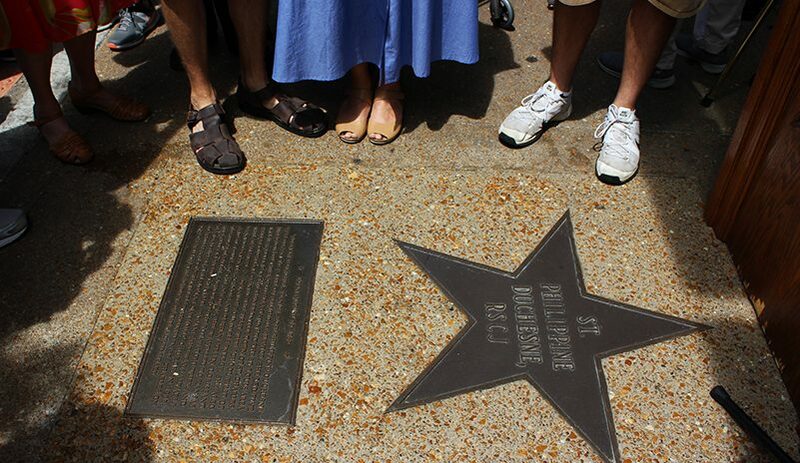 Embedded in the sidewalks of the Delmar Loop, the Walk of Fame consists of brass stars with the name of an honoree and bronze plaques with biographical information summarizing his or her achievements and connection to the city. According to Walk of Fame founder Joe Edwards, the plaques distinguish it from similar projects throughout the country, and make it educational as well as entertaining. St. Philippine joins 150 prominent citizens from Pierre Laclede and Auguste Chouteau to Jack Buck and Maya Angelou. For a complete list of inductees, click here. The Walk of Fame is free, open all year and easily accessible.